The non-contact liquid level sensor is intended for chemical or water storage applications in above grade metal or reinforced concrete tanks or below grade tanks of any material. Select this sensor for easy process conditions with corrosive media, light agitation, condensation or vapor, and installation in a low-profile tank adapter or flange fitting. Typical applications include chemical bulk storage and tanker trucks. The intrinsically safe 26 GHz. 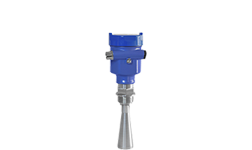 pulse radar level transmitter provides continuous level measurement up to 32.8’ (10m) with a 4-20 mA analog and HART digital signal output, and is configured via its integral push button display module or WebCal software. The non-contact liquid level sensor is intended for chemical or water storage applications in above grade metal or reinforced concrete tanks or below grade tanks of any material. Select this sensor for easy application conditions with corrosive media, light agitation, condensation or vapor, and installation in a low-profile tank adapter or flange fitting. 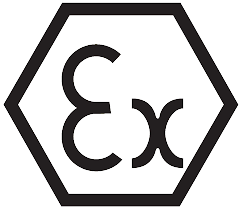 Typical applications include chemical bulk storage and tanker trucks. The intrinsically safe 26 GHz. pulse radar transmitter provides continuous level measurement up to 98.4’ (30m) with a 4-20 mA analog and HART digital signal output, and is configured via its integral push button display module or WebCal software. The non-contact liquid level sensor is intended for petroleum, water, wastewater and diluted chemical storage or process conditions in above or below grade tanks of any material. Select this sensor for challenging process conditions with low or non-corrosive media, light surface foam or agitation, higher temperature or pressure, condensation or vapor, and installation in a tank adapter, flange fitting or metal stand-pipe. Typical applications include bulk storage, tanker truck, RO storage, process tank, waste sump and neutralization tanks. The intrinsically safe 6.3 GHz. 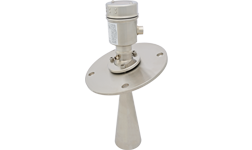 pulse radar transmitter provides continuous level measurement up to 114.8’ (35m) with a 4-20 mA analog and HART digital signal output, and is configured via its integral push button display module. The non-contact liquid level sensor is intended for chemical and petroleum storage or process applications in above grade metal or reinforced concrete tanks or below grade tanks of any material. Select this sensor for harsh process conditions with corrosive or low dielectric media, heavy surface foam or agitation, higher pressure, steam, condensation or vapor, and installation in a flange fitting. Due to the wider beam angle, special attention should be given to ensure that the sensor is located with unobstructed measurement space. Typical applications include process tanks. The general purpose 26 GHz. 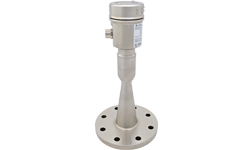 pulse radar level transmitter provides continuous level measurement up to 32.8’ (10m) with a 4-20 mA signal output, and is configured via its integral push button display module. The non-contact liquid level sensor is intended for chemical or water storage applications in above grade metal or reinforced concrete tanks or below grade tanks of any material. Select this sensor for easy process conditions with corrosive media, light agitation, condensation or vapor, and installation in a low-profile tank adapter or flange fitting. Typical applications include chemical bulk storage and tanker trucks. The general purpose 26 GHz. 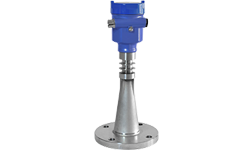 pulse radar level transmitter provides continuous level measurement up to 98.4’ (30m) with a 4-20 mA signal output, and is configured via its integral push button display module. 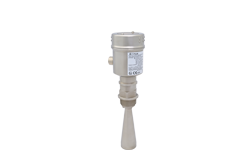 The non-contact liquid level sensor is intended for petroleum, water, wastewater and diluted chemical storage or process applications in above or below grade tanks of any material. Select this sensor for challenging process conditions with low or non-corrosive media, light surface foam or agitation, higher temperature or pressure, condensation or vapor, and installation in a tank adapter, flange fitting or metal stand-pipe. Typical applications include bulk storage, tanker truck, process tank, waste sump and neutralization tanks. The general purpose 26 GHz. 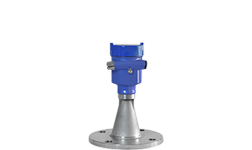 pulse radar level transmitter provides continuous level measurement up to 65.6’ (20m) with a 4-20 mA signal output, and is configured via its integral push button display module. 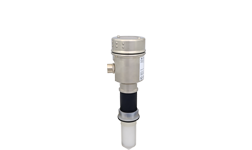 The non-contact liquid level sensor is intended for chemical storage or process applications in above or below grade tanks of any material. Select this sensor for challenging process conditions with corrosive media, light surface foam or agitation, higher temperature or pressure, condensation or vapor, and installation in a flange fitting. Typical applications include bulk storage and process tanks. The general purpose 6.3 GHz. 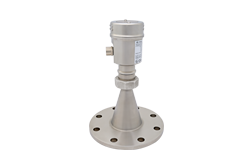 pulse radar level transmitter provides continuous level measurement up to 114.8’ (35m) with a 4-20 mA signal output, and is configured via its integral push button display module. 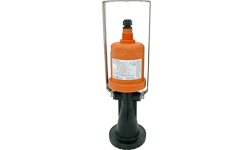 The non-contact liquid level sensor is intended for chemical and petroleum storage or process applications in above grade metal or reinforced concrete tanks or below grade tanks of any material. Select this sensor for harsh process conditions with corrosive or low dielectric media, heavy surface foam or agitation, higher pressure, steam, condensation or vapor, and installation in a flange fitting. Due to the wider beam angle, special attention should be given to ensure that the sensor is located with unobstructed measurement space. Typical applications include process tanks. The general purpose 26 GHz. 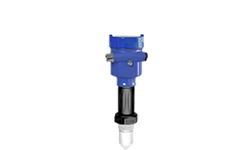 pulse radar level transmitter provides continuous level measurement up to 98.4’ (30m) with a 4-20 mA signal output, and is configured via its remote push button display module. 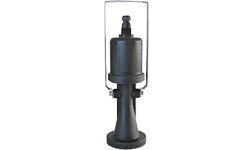 The non-contact liquid level sensor is intended for industrial wastewater, municipal storm or sewer lift station, reservoir, river, canal or open channel applications located below or above grade. Select this sensor for challenging process conditions that may include light surface foam or agitation, small trash or plant material, wind, condensation or vapor. Each comes with a 32.8’ (10m) cable, mounting bracket and display module. 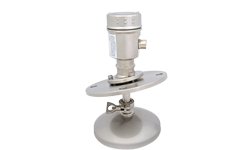 The sensor is designed for bracket mount installation suspended above the liquid level. The intrinsically safe 26 GHz. pulse radar transmitter provides continuous level measurement up to 229.7’ (70m) with a 4-20 mA analog and HART digital signal output, and is configured via its integral push button display module or WebCal software. The non-contact solids level sensor is intended for dry solid media including aggregates, grains, pellets, powders and building materials. Select this sensor for challenging process conditions with moderate to significant dust, and installation with an adjustable gimbal flange or mounting bracket. Typical applications include silos, stockpiles, transfer stations and crushers. The intrinsically safe 26 GHz. pulse radar transmitter provides continuous level measurement up to 229.7’ (70m) with a 4-20 mA analog and HART digital signal output, and is configured via its integral push button display module or WebCal software. The non-contact solids level sensor is intended for dry solid media including aggregates, grains, pellets, powders and building materials. Select this sensor for the most difficult process conditions with significant to extreme dust, and installation with an adjustable gimbal flange. For ease of installation, the parabolic antenna can be unclamped, inserted through the base of a riser, and reattached to the sensor. Typical applications include silos.